From Kudos To Credit Cards For Qubits! Mark Burginger and I have emailed regularly, IM’ed infrequently, and skype’d once since way back in May of 2005. Since that time, I’ve had the pleasure of watching an idea become a design, a design become a plan, a plan become a physical model, and a physical model become a product that now everyone can get their hands on. As a theoretician, my occupational concerns are only the first two of those steps, but I do appreciate when someone can take an idea and run with it all the way to the google checkout link (although setting up a google account and selling nanobots by the Zip-Loc bag has occurred to me as an approach to continue my work if federal funding ever becomes an issue). After two short (well, maybe not to the Burginger family) years (and two short posts at this site about his progress), the long-awaited email arrived announcing the official release of the first pressing (they are plastic, after all) of Qubits! My order’s already in and I encourage anyone reading to pick up a carton and take the afternoon off. 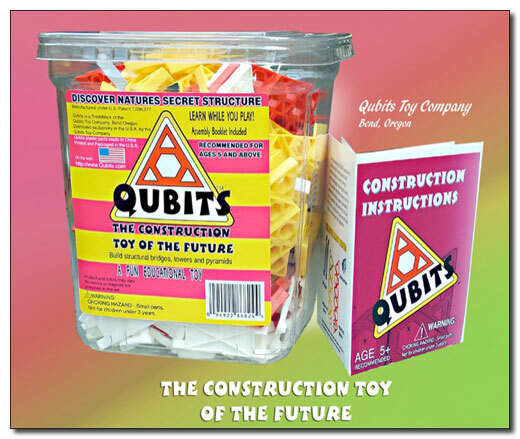 Click on the image to go to the Qubits website. I owe to those afternoons [playing with Legos in my distant youth] two benefits that made chemistry and biology easier, helped with mathematics, and progressed me naturally into computers and programming. The first was a considerable, sometimes arduous, introduction to problem solving. When you have a limited number of parts, a limited number of ways to put those parts together, and an otherwise unlimited imagination for what you want to build, you find yourself thinking far harder that you would with a toy robot containing hinged arms and a removable plastic gun. The second benefit is something I came to realize during my second semester of organic chemistry. The fundamental building blocks are different in chemistry and Legos, but the logic is the same. The great varieties of materials we find at the human scale are a result of a limited number of building blocks that connect together in a finite number of ways. We call these building blocks “atoms” and we call these connections “chemical bonds.” They are harder to work with than hand-sized pieces of plastic, but the same logic applies. There is a big difference between learning and thinking. Learning is the process of being shown how to do something. Thinking is the process of figuring it out for yourself. My youth among “incomplete toys” made me THINK. Given the problematic state of math and science education in the US today, I think anything we can do to get children thinking as soon as possible is critical to our success as the innovation hub of this planet. Within the giant Venn Diagram of what we call “critical thinking” lies the little-known and poorly capitalized circle called “edutainment.” You’re never too old to think in the abstract about non-mission critical problems (yes, I will have my carton spilled out on the floor at some point in the near future) and you’re never too young to begin to understand how to make the complex out of the simple to accomplish a task. Well, OK. Maybe you should be “5 or older” just to make sure your hand/eye coordination is there.